Investigate the decay of a radioactive substance. The half-life and the number of radioactive atoms can be adjusted, and theoretical or random decay can be observed. Data can be interpreted visually using a dynamic graph, a bar chart, and a table. 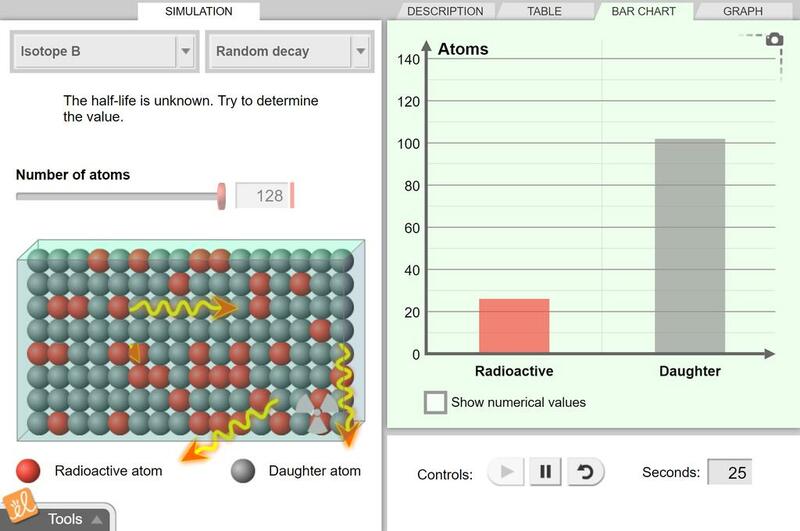 Determine the half-lives of two sample isotopes as well as samples with randomly generated half-lives. Challenging concept for Middle School! I use a whole class instruction approach on this one only. Use a wireless mouse for students. This is a wonderful way for students to explore and learn the concept of half life and radioactive decay. Very interact lab and my students liked it. I recommend you ask them to bring their headphones in adavance.